This is an image mapped point to scripture reference to read the scripture. The book of Yehoshua is a book of victory with the YHVH goes before them. Victory comes when there is faith, trust , obedience, flee from idolatry and Santification unto YHVH Elohim. The list of vanquished Kenan melekhim is a summary of the stories of the conquest contained in the Books of Yehoshua and Shof'tim. It major importance lies in recording city names not mentioned in the actual accounts and thus fills in some gaps in the picture of the wars of the conquest. 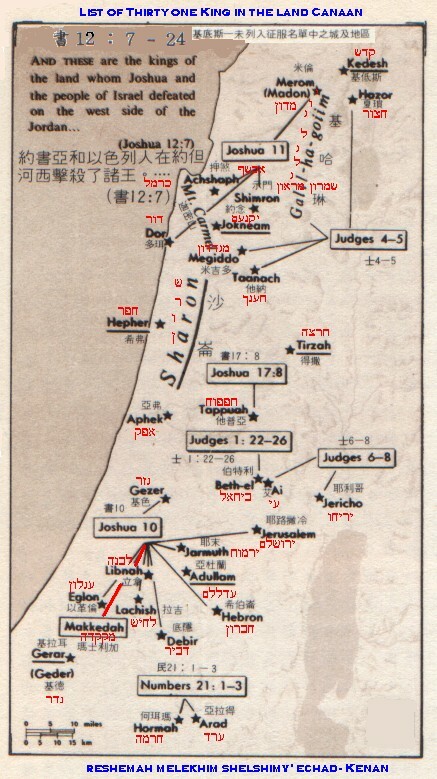 Beside the Melekhim of the north, the list contains several cities in Har Efrayim and in the Sharon, Adullam in the Shephelah and "Ha Melek Goyim in Gili". There were about seven years of war in the land of canaan against 31 kings, had 3 campaigns, numerous battles and in chapter 7 was the only time they experience defeat from Ai (Yehoshua 7:5) due to Achen hid the forbidden treasures. Achen sinned of covetousness and he invaded YHVH's rights. Their first victory was Jericho and they were warn not to take the spoil. It was the type of first fruits that belongs to YHVH which Achen robbed. Ai or Aija or Aiath or Hai = “heap of ruins”Jericho and Ai became model signal victories for Israel (Jos 9:3). Some former inhabitants of Ai returned from Babylonian exile (Ezr 2:8; Neh 7:32). Heights; elevation; A Canaanite city in Judah (Jos 10:3, Jos 10:5, Jos 10:23; Jos 12:11; Jos 15:35; Neh 11:29). place of shepherds the location of a cave in Judah where Yehoshua captured and executed five Canaanite kings during the conquest; located near Beth horon and Libnah (Jos 10:10, Jos 10:16-17, Jos 10:21, Jos 10:28-29; Jos 12:16; Jos 15:41). The House of God; Abraham tented near it (Gen 12:8; Gen 13:3), and Jacob dreamed important dreams there (Gen 28:19). It was given to the tribe of Benjamin (Jos 12:16; Jos 18:22). Sandy Manasseh inherited it and it was a Levitical city as well (Jos_21:25). Mitzvot n59, p188, p189 in the 613 mitzvot– These three mitzvot are all associated with Amalek. Amalek was the first nation to rise up against the people of Adonai with the sword (Ex. 17:8-16). They did so while the people of Israel were in a weakened state, having just departed from Egyptian captivity. The literal fulfillment of these mitzvot is only in the Land of Israel but they contain universal spiritual principles that apply to all people. P188 refers to the extinction of Amalek. The people of Amalek were to be completely destroyed, including men, women, children, all of their livestock, and any other personal property that they had. Talmud Connection: Sotah 8; Nazarean Codicil Connection: Eph. 6:11-18. Nazarean Codicil Connections: Acts 15:20, 29;21:25; 2 Cor 6:16; 1 Thes. 1:9; 1 Jn. 5:21 (These connections apply equally for n59 and p189). It was the desire of Amalek to destroy the whole nation of Israel while they were defenseless coming out of Egypt -- all of their men, women, children, and their livestock. Now, reciprocity comes upon them as Adonai declares that none of them should remain alive. Nazarean Codicil Connections: 2 Pet. 2:10-22 esp. v. 15; The Epistle of Jude esp. v. 11 (see also Num. 22-24). "Be ye not unequally yoked together with unbelievers: for what fellowship hath righteousness with unrighteousness? and what communion hath light with darkness? And what concord hath Christ with Belial? or what part hath he that believeth with an infidel? And what agreement hath the temple of God with idols? for ye are the temple of the living God; as God hath said, I will dwell in them, and walk in them; and I will be their God, and they shall be my people. Therefore come out from among them, and be ye separate, saith the Lord, and touch not the unclean thing; and I will receive you, And will be a Father unto you, and ye shall be my sons and daughters, saith the Lord Almighty."